For his Player page, click here. 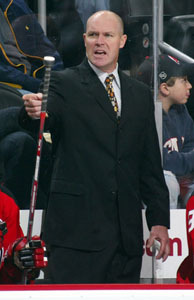 Johnny Mac, he was the first former Devils player to become coach of the team. instead. He was also thought of as a candidate when the 2009 search ended with Jacques Lemaire. Lemaire's contract was. However, Lemaire retired just days after the 09-10 season ended for them. time, however, he got the call. Christmas time. Needless to say, he was gone by then. MSG team in the studio.